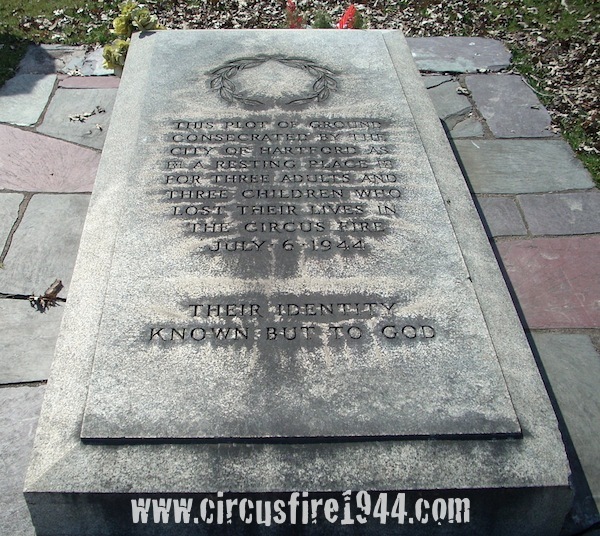 Body #4512 was found dead at the circus grounds after the fire on July 6, taken to the State Armory and then to the Hartford Hospital morgue where positive identification was never made. 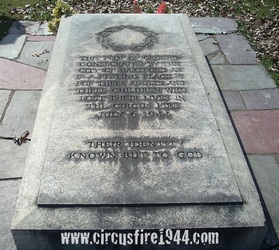 #4512 was prepared by Dillon Funeral Home for burial at Northwood Cemetery in Wilson, Connecticut, on July 10. Descriptive features of #4512 include: female, 30 to 35 years of age, possibly black, questionably white, no portion of the skin shows natural color; height 5'-2" to 5'-5", approximately 140 to 160 pounds, short and stocky, wide hips; 21 1/2" head circumference, hair burned off; wearing an ornamental ring with missing stones on right ring finger, a Sterling Silver slave bracelet with crossed R's and an eagle on the left wrist, and an 18 karat white gold wedding band on left ring finger; lower legs mostly absent, though #4512 was wearing white Physical Culture pumps with solid toes. Dental examination shows that upper teeth slope forward, all teeth large and strong.